Note: Percentages mentioned are often rounded, and not always will add up to exactly 100% in totals for a year. On this webpage an overview of development of photovoltaics in Flanders (Belgium) is made in a few graphs, also highlighting the position in relation to other "renewable" electricity options (Section I). This page is an extension of the webpage with the detailed monthly updates with many more graphs highlighting the Flemish and Belgium PV-market. See the main page. Graph updated based on March 2, 2012 month reports by VREG (Section I) and the most recent Excel file "Evolutie van het aantal zonnepanelen en hun vermogen" (misleading title translated as "Evolution of the number of PV-modules and their capacity"), update published by VREG on May 2, 2012 (Section II). Note that, under normal conditions (synchronized reports), accumulated results between the two datasets may differ slightly because of the period of sometimes several days between their publication dates. Fig. 1 - This graph shows the number of new PV-installations per year registered with VREG able to claim green certificates for "renewable" electricity. Since the number of PV-systems is so overwhelming with respect to the few installations for the other "options", the latter can not be seen on this scale. To view their contribution, refer to the detail graph in Fig. 2. Fig. 2 - Detail of Fig. 1 showing the contribution of all the other "renewable" electricity options (PV-installation number going completely off-scale in this graph). Beyond photovoltaics, the biggest contributor with respect to "number of installations" appear to have been "biogas rest", windpower and biomass installations using materials from forestry and/or agriculture. Number of PV-installations appear at the bottom of the yellow columns. Note that, starting with the Feb. 1, 2012 report, a new option has been included (possibly better: split-off), biogas (mainly) from agricultural sources (pink column segments). Fig. 3 - Comparable to Fig. 1, but now showing the nominal capacity of the accumulated "renewable electricity" generating installations per year, in kWe. Options are grouped per year and are shown with separate columns. For PV, MWe is the maximum AC-power of the inverters. Even on this power capacity scale, PV-installations dominate all other renewable options. Note that in 2011 total capacity has bypassed the volume known for previous record year 2009 by far (already with 43%, and more to come). In the January 1, 2012 report strangely a large 280 MWe installation for the (previously unlisted!) year 1978 has been introduced, processing biomass from agriculture and/or forestry (large green column at left). In the same publication an installation in that category listed for 2005, and with a capacity of 130 MWe, has been removed, also for unknown reasons. For detail of a stacked graph, see Fig. 4. Fig. 4. Stacked graph with all renewable electricity generating options on top of each other, per year. The impact of photovoltaics is impressive: it has most (accumulated) capacity of all options, although, of course, it cannot generate as much since installations only produce electricity in daylight hours. Preliminary accumulation for 2011 has now reached 648 MWac for PV. Already far beyond the (preliminary) total new capacity in 2010, and also beyond reach of the previous record year 2009 volume. Note also the old single large new installation for agriculture/forestry biomass conversion at left (introduced in the Jan. 1, 2012 report). For 2012 only little new capacity has been registered with VREG (approximately 11 MWac). Fig. 6 - Graph comparable to Fig. 5, but now with accumulation of photovoltaic installation capacity at the end of each year (or, for 2011, as published in the last month report). With most recent data in the monthly reports, accumulation has already reached a level of 1.549 MWac, which could result in a nominal DC capacity of app. 1.704 MWp. In the summer of 2011, the magic "1 GWp barrier" has probably been broken in Flanders. In Belgium as a whole, that could have happened in early summer of that year (the other 2 markets, Walloon region and Brussels, are (as yet) too small to have a serious contribution on top of the Flanders data, see original statistics page on Belgium). This series of graphs has been made using year data made available in a separate spreadsheet (and/or pdf) from VREG with data per year and/or per quarter. The data in this specific document can differ slightly from the data that are presented in the mostly accompanying month reports (graphs in Section I), since they are not always published at exactly the same date. Hence: accumulation data etc. shown in this section might deviate slightly from those extracted from the data in the monthly reports. The "timing" of this specific spreadsheet might be shortly before, or shortly after the monthly VREG report. For the first results of 2012, see the final figure in the third series. Data processed with Excel 2010. First series: evolution in the calendar year 2011 (adjustments up till update in July 3, 2012 VREG spreadsheet). Fig. 7 - Updated results for the (whole) year 2011 (will be further adjusted in coming reports!). For previous versions: May 2, 2012, April 1, 2012, March 1, 2012. Number of new PV-installations per period. VREG has divided the "population" of new PV-installations into three big categories: installations up till 10 kW (AC), those with AC power larger than 10 kW, up till 250 kW, and, finally, the largest category with AC power over 250 kW. In their 2011 overview, VREG has again divided the new capacity into three periods for 2011: First half year - January up till June (blue columns), third quarter - July up till September (purple columns), and last quarter - October up till December 2011 (green columns). Additions for the whole calendar year are given in the final column group at far right in slightly deviating colours. The Y-axis has a logarithmic scale. Note that in the third and fourth quarter of 2011 more installations have been registered by VREG (22.762 + 23.142 = 45.904) as in the first half year for the smallest category (35.839). The larger categories, however, dropped off considerably with new installations in the two final quarters in 2011: 603 (Q III + IV) instead of 844 (Q I + II) for category 10 - 250 kW, and only 16 instead of 304 for the largest category >250 kW. Ratio for total numbers (final column triplet) is also higher (45.523) with respect to that for the first half year (36.987). In the present update, the fourth quarter of 2011 saw a negligible volume of 215 installations more than in the third quarter, an increase of less than 1% (note that in the report at the start of February 2012, a difference of 16% less installations were reported for the final quarter related to the previous one). Fig. 8 - Figure comparable to Fig. 7, but now results for the three periods discriminated by VREG for the year 2011 have been stacked on top of each other and given for all three categories as well as for total for all installations (far right). For previous versions: May 2, 2012, April 1, 2012, March 1, 2012. Y-axis now is in normal mode to show the huge impact of the numbers of installations within the smallest category (up till 10 kWac). Total installation number in this VREG update has reached a volume of 83.510 for the year 2011 (March 1, 2012 report: 79.520, an increase of 5,0%). Shares for the three periods shown are 44,3% (first half year), 27,8% (July up till September), and 28,0% (final quarter), respectively. 1.767 new installations (or: portions of larger systems) >10 kWac have been reported sofar by VREG for the record year 2011. 320 (18%) of these installations (or portions of big ones) had sizes over 250 kWac. Fig. 9 - Figure comparable to Fig. 8, but now accumulated capacity (MWac) has been shown. For previous versions: May 2, 2012, April 1, 2012, March 1, 2012. This gives a somewhat different picture, since the relative "few" installations in the two bigger installation categories have a considerable volume of capacity. 144,8 MWac new in 2011 for the category 10 - 250 kWac, and an astonishing 263,7 MWac for the largest category > 250 kWac. Please note, that in the March 1, 2012 report, that latter volume was only 167,1 MWac, and that in the May 2, 2012 report, even a volume of 329,9 MWac has been published. Apparently, a considerable volume (66 MWac!) has later been withdrawn by VREG for unknown reasons. 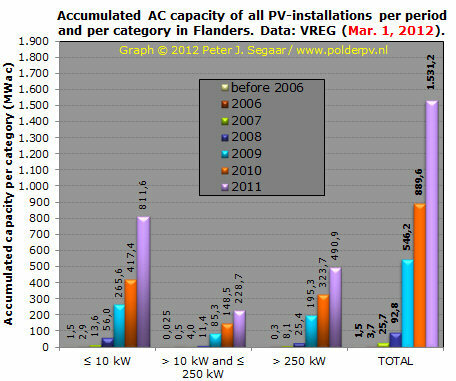 A volume of 21% of newly reported capacity in 2011 has been added in Flanders in the third quarter of that year. The fourth quarter has added 17% of total volume. In combination with the high level of 411,8 MWac now accumulated for the smallest category (up till 10 kWac), total new capacity added in 2011 already has reached a volume of 820,2 MWac. Please note that this has changed from 641,6 on March 1, via 815,5 on April 1, and 845,3 MWac in the May 2, 2012 report. Hence, after strong increases in monthly updates, some 30 MWac appears to have been "withdrawn" from the 2011 records between the May 2 and July 3, 2012, reports. If a conversion factor of 1,1 is applied (DC capacity = AC capacity * 1,1), new nominal STC power added in 2011 could already have reached an astonishing level of 902 MWp, which is an exceptionally good result for a small region like Flanders. Second series: Evolution of PV-installations over the years. Fig. 10 - Evolution of accumulated PV-capacity (MWac) per category and per year (2012 premature results for first half year). For previous versions: May 2, 2012, April 1, 2012, March 1, 2012. * Note: on July 24, 2012, the "market data" web page of branche organisation PV-Vlaanderen still depicted ancient, end of January 2012 data for 2011, claiming only 1.476 MWac accumulated capacity (see Fig. 10 for actual number), and a year growth of only 592 MWac for that year (for the latter, see Fig. 11; hence underestimating 14% and even 28% of volumes reported in the July 3, 2012 update). Fig. 11 - New AC capacity per year and per category, stacked columns. For previous versions: May 2, 2012, April 1, 2012, March 1, 2012. 2011 is - by far - the best year for Flanders, with already an incredible volume of 820 MWac (in the March 1, 2012 report that used to be only 642 MWac) new PV-capacity, of which an impressive portion of 412 MWac has been delivered by small installations up till 10 kWac (50,2%), 145 MWac by installations > 10 kWac and up till 250 kWac (17,7%), and 32,2% (264 MWac) by larger installations. The impact of the smallest category is bigger than in the years 2009 (previous record year, share 46,1%) and 2010 (share 42,9%). The large volume of > 250 kWac installations in 2009 can be attributed for a considerable part to the famous multi-site 40 MW project by Katoen Natie delivered end of that year. 2011 already has a factor 1,8 times the new volume of previous record year 2009. However, thick dark clouds are already raining out on Flemish territory. The market has dwindled in the first half year of 2012, and is expected to collapse completely as of August (green certificate value for all new installations max. 9 Eurocent/kWh). Up till now only 111 MWac has been reported by VREG in 2012. Almost entirely consisting of smaller residential installations. Flanders has had its heyday, and will enter a new Dark Age if the government does not change their policy with respect to photovoltaics. Fig. 12 - New number of installations (total only, number is dominated by the smallest installation category by far, see Fig. 7) per year. Logarithmic Y-axis. For previous versions: May 2, 2012, April 1, 2012, March 1, 2012. In most years more installations were registered by VREG than in the previous year, with the exception of 2010, and, to be expected, a collaps in 2012 (first preliminary half year results shown only). Total of 83.510 in 2011 signifies a volume a factor 198 bigger than the new volume registered for the year 2006, and has been over a factor 2½ the volume realised in 2010. Fig. 13 - Accumulation of AC capacity of PV-installations in Flanders up till 2012 (note: preliminary data for first half year of 2012); graph with three different system size categories stacked per year column. For previous versions: May 2, 2012, April 1, 2012, March 1, 2012. End of 2011, Flanders had a minimum of 1.716 MWac (possibly in the order of 1.888 MWp nominal DC capacity), with contributions of 48,3% (smallest <=10 kWac), 17,2% ("medium"-sized) and 34,4% (largest installation categories). Year-on-year (YOY) growth percentages (small-printed numbers/arrows) have been staggering for Flanders, ranging from 145-508 percent/year up till 2009, and still showing very strong growth in the periods 2009-2010 (65%) and 2010-2011 (92%). The final number for 2011 may still change a bit, since full capacity additions for 2011 might still not be complete (VREG updates "older" capacities in new reports). 2012 has been a dramatic year for installations >10 kWac, and will become even darker as the green certificate value for smaller installations will drop dramatically from 23 to 9 Eurocent/kWh as of August 1, 2012 (see webpage VREG with tariff changes; for Dutch abstract of political background of these changes look here). Status on July 3, 2012 is that 1.827 MWac has been registered by VREG. This could be an equivalent of slightly over 2 GWp (if DC capacity is considered 1,1*AC capacity). Fig. 14 - Graph comparable to the one shown in Fig. 13, but now number of PV-installations accumulated end of each year is given. Y-axis and numbers are given in thousands. For previous versions: May 2, 2012, April 1, 2012, March 1, 2012. That number is, of course, dominated by the "small" category up till 10 kWac (green column segments), that reached a preliminary high level of 177.596 installations end of 2011, 97,7% of total volume of 181.734. With data presently available, growth 2010-2011 has been a very strong 85,0% YOY. In the first half year of 2012, only the smallest category grew notably, with total number of PV-installations reaching a record level of 200.910. Note that the "Vlaamse Gewest" (that is Flanders, without Brussels) had 6.251.983 inhabitants in 2010 (Wikipedia). This means that, calculating with 196.670 smaller installations end of June 2012 (max. size 10 kWac), on average one in 31 inhabitants "could have" a PV-installation on its premises. A good start of a truly decentralised energy (electricity) revolution. Fig. 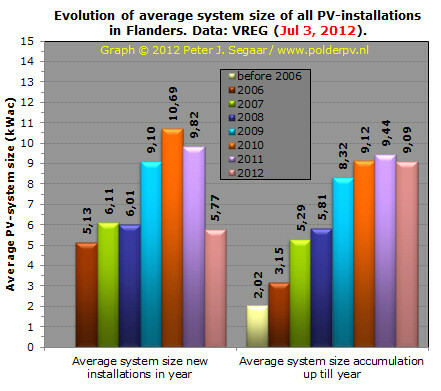 15 - In this graph the evolution of the average PV-system size in Flanders is given based upon the last available data published by VREG. With preliminary results for the first half year of 2012. 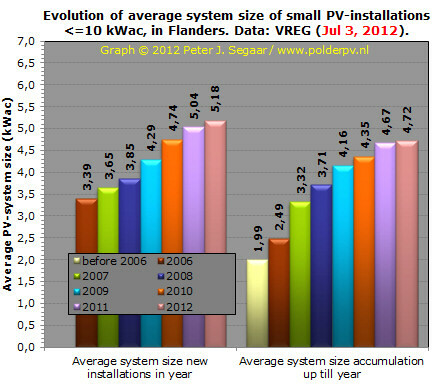 In the left column series average system size has been shown for the new PV-installations in the (part of the) year depicted, in the right column series the average system size for all accumulated installations end of the (part of the) year has been shown. In the former series average size varies from year to year, with a notable "new year installation record" of 10,7 kWac on average in 2010 (many large installations have been reported in that year, increasing the system average). Due to strong degression of the value of green certificates to be obtained by larger installations, and the resulting collapse of that market, system average in 2012 has strongly decreased (5,8 kWac in first half of the year): only the small residential market segment is still growing (probably up till July), the bigger two segments did not show any significant "activity". The second group shows stepwise increase of system average of ALL (accumulated) installations, with a temporary "stall" in 2008. An important factor in the decrease of growth in the average system size has been the strong growth in the most important sub-market of all, the residential market, in record year 2011 (see Fig. 10 and Fig. 12 for impact). Resulting in 9,4 kWac on average for all installations end of 2011, which has receded to a level of 9,1 kWac in the first half of 2012. In conclusion, since 2006 Flanders has reached very good results in the global records for photovoltaics. It remains to be seen if there will be an attractive business-case left for larger installation categories (as of Jan. 1, 2012, the value for green certificates has dwindled to 9 Eurocent/kWh for installations > 250 kWac), as module prices drop further. The same will apply to the residential market segment, as of August 1, 2012. Fig. 16 - Graph comparable to that shown in Fig. 15, but now only the residential market segment <= 10 kWac has been shown. This clearly shows the continuous upward trend in average system size newly installed on private houses and smaller commercial dwellings. As of 2006, that average has increased from 3,4 up till 5,2 kWac (possibly equivalent to DC generator sizes of 3,7 up till 5,7 kWp). In the second half of the figure, average system size of all <= 10 kWac installations also increased in course of time, ending in the second half of 2012 with an average size of 4,7 kWac (app. 5,2 kWp). That is much higher than in neighbouring Netherlands, where residential system size is often between 1 and 4 kWp, with many installations sized 1-2 kWp or even smaller (actual status impossible to pin down, since most installations in Netherlands are not registered in a public register...). Third series: evolution in the calendar year 2012. The February 6, 2012, "global" update by VREG provided first results for 2012 and have been updated in later monthly 2012 reports. In the final figure of this section I present the first results for new capacity registered. It is a rather modest volume, because the implementation of large installations seems to have stalled completely. Further reports will have to be awaited to see if the Flemish market really seems have come to a "stand-still" such as branche organisation PV-Vlaanderen has suggested early in the year. Volumes in the max. 10 kWac market segment have been growing - end of June 2012 already 99 MWac has been registered for that category, which could amount to a volume of app. 109 MWp. Neighbouring Netherlands realized a volume of only 43 MWp in the whole of 2011, according to first (preliminary) data by CBS. Fig. 18 - Preliminary results for year growth of PV market in Belgium. Results for 2011 can change, in particular with respect to the volume for Flanders, the most dominant market in this country. Numbers for the Walloon region and for Brussels have been originally derived from preliminary estimates by Apere, end of 2011. For Walloon region, preliminary volume of approximately 107,4 MVA for PV has been assumed based on a CWaPE update date-stamped February 29, 2012. For Brussels no new data for 2011 are known (regulatory body: BRUGEL). Status is that at least 954 MWac has been added in Belgium in 2011, with more volume to be expected. This could account to a new DC volume of app. 1.049 MWp. Fig. 19 - As Fig. 18, but now the main figure shows accumulated capacities at the end of the year and, for reference, the year growth in the inset. 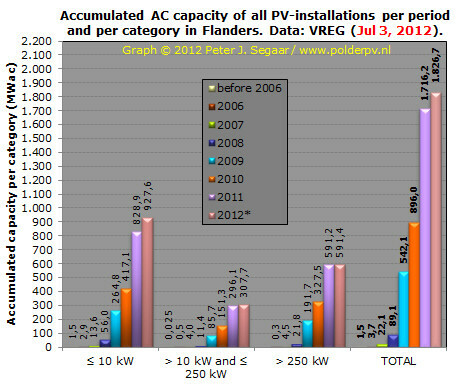 Already, the small country Belgium, had accumulated 1.946 MWac of PV capacity, end of 2011 (1.740 MWac for Flanders). Which might translate into a record breaking 2.141 MWp of nominal STC (DC) generator capacity, the second "Gigawatt" (DC) certainly already broken. An astonishing volume for a small country like Belgium. With later additions accumulated in the May 2, 2012 VREG report, total capacity for Flanders now has already reached 1.797 MWac, with an expected DC volume of approximately 1.977 MWp. Hence, in the coming report to appear around June 1, 2012, it is highly likely that Flanders only will break its own 2 GWp barrier. A phenomenal achievement. Fig. 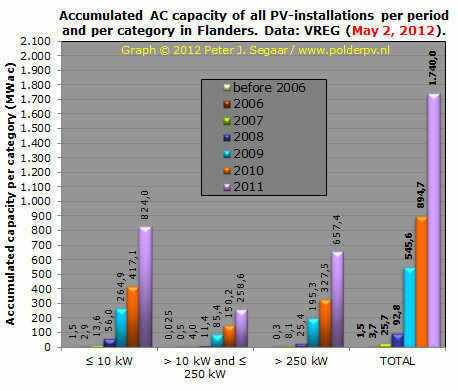 20 - Update from the original figure added to Segaar's Solarplaza / Solar Future Belgium article (published March 6, 2012, with older VREG data from Feb. 6, 2012). In the present version, the status of Flemish data published by VREG on May 2, 2012 has been shown (more recent data for the other two sub markets not yet known, Walloon region has been updated with preliminary CWaPE data for 2011). Segmentation of the Flemish market in three categories for main figure (capacity, MWac). Inset: accumulation end of each year for the three sub-markets. Webpage made up for the first time May 18, 2011. Updates: August 23, 2011 (VREG monthly report, publ. Aug. 1, 2011); October 11, 2011 (VREG Sep. 1, 2011 report), October 24, 2011 (VREG Oct. 1, 2011 report), November 23, 2011 (VREG Nov. 1, 2011 report), December 12, 2011 (VREG Dec. 1, 2011 report), January 9, 2012 (VREG separate statistics file yearly evolution [addition of "Section II"], Jan. 4, 2012), February 1, 2012 (VREG Jan. 1, 2012 report), February 19, 2012 (VREG Feb. 1, 2012 month report and Feb. 6, 2012 Excel file), March 15, 2012 (VREG Mar. 1, 2012 Excel file year data, addition of updated segmentation graph Fig. 19), March 30, 2012 (VREG month report March 2, 2012 >> section I updated), April 20, 2012 (VREG Apr. 1 pdf year data), May 5, 2012 (VREG May 2, 2012 Excel file), July 24, 2012 (VREG July 3, 2012 Excel file).